Photographs taken by the author of geographical features that for one reason or another have impressed me. I don't consider myself a wordsmith but I've done my best to describe each of the photographs to put across what it was that impressed me about them. 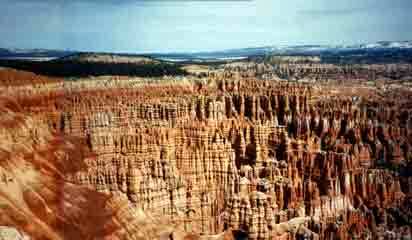 Bryce Canyon can be found in Utah in the USA. An early western comment about the place was "well that's one hell of a place to lose a cow". It is spread over a few square miles on the edge of a high ridge. The rock is a red sandstone which has eroded into hundreds of groups of horizontal columns each a few feet wide. The columns taper into points at their tops but descend hundreds of feet into the valley below. Not that you can see the valley (or any cows that it might have wondered down into it) due to the sheer volume of the columns. In the photograph the ridge lies to the left and the columns occupy the entire foreground and continue off to the right and also stretch beyond into the far distance. Thus the image is very three dimensional. It is made more complex because the sandstone has a noticeable horizontal strata to it and so as well as seeing the vertical lines of the columns you can see distinct horizontal lines of light and shade jumping the gaps between the columns - again from left to right and front to back. Most pictures and descriptions of the valley of the Colorado river are of the Grand Canyon. The big problem with the Grand Canyon though is comprehending its enormous size - it is simply too big to take in without being there and realising that you have to move your head around to take it all in. 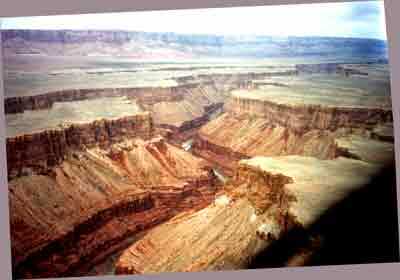 This photograph is of the Colorado river well above the Grand Canyon. I was lucky enough to find myself on an scenic flight from Monument Valley to the Grand Canyon which included flying the entire upper length of the Colorado. The picture shows that the river originally had a very wide and flat valley, the sides of which are cliff like due to the lack of vegetation and erosion. The river meandered through this wide flat valley. However since the valley's formation something has happened to cause the river to erode down into the valley floor. It has done this very quickly so that the river has generated what looks like a jagged crack down the middle of the valley. The sides of this inner valley have a distinct profile. It is difficult to judge the scale of the picture (taken from the air) but I would guess that the inner valley is at least 400 feet deep with the first hundred feet being a vertical cliff, the next two hundred feet being at a 45 degree slope and the final hundred feet again being vertical. This profile continues throughout the length of the river in the photograph as it meanders alternately right and then left into the distance. A couple of tributary rivers join it and they are equally cut down into the floor of the upper valley. The river can just be seen in places at the bottom of the inner valley. The walls of this valley are of red rock and the upper valley is covered in light yellowy grass. 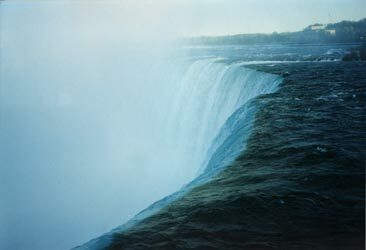 This is a picture taken of Niagara Falls from the viewing platform right next to the edge at the top on the Canadian side of the falls. There isn't much to see - most of the picture consists of shades of blue. But for me it reveals the power of nature. The right of the picture shows what looks like a lake. The left of the photograph shows a big circular void. In the middle the water is flowing over the edge of the lake and descending into the void. This is happening both in the foreground, in the middle of the picture and you'd guess (correctly) also in the far of the picture although that is hidden by a large cloud of mist rising out of the void. I love this view because I can remember watching the water flow over the edge, and continue to flow over the edge and I know that it continues doing this all day, and every day and every year since long before man came to the area. The idea of the power of nature is slightly dampened when you discover that man does turn down the flow at night to fill the reservoirs used for the big hydro electric projects built around the falls - however its still nature that got the water into the lake in the first place. 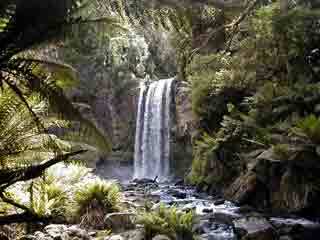 The Otway Mountains form a range of forested highland south west of Melbourne in Victoria Australia. The range includes numerous waterfalls but this one I judged to be the most visibly striking. The photograph was taken from the designated photo point below the falls and slightly to the right of them - I did take numerous photographs from other points but this one was easily the best. The falls are of a large stream falling down a fifty foot cliff and then flowing down a boulder strewn bed. The sun is just catching the water as it comes over the edge of the falls. What makes the scene is the lush greenery which surrounds the falls on both sides and above and below it. Much of the greenery consists of ferns - including in the foreground to the left and above the photograph point. It looks very peaceful. 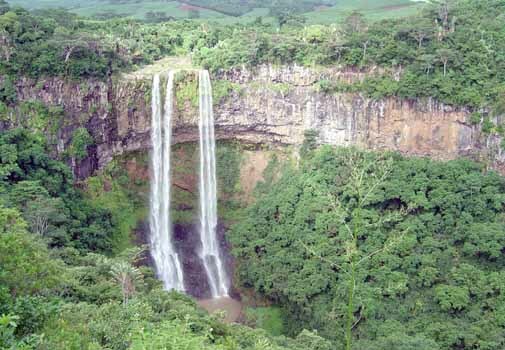 One of several waterfalls in the highlands in the south west of the island of Mauritius. This one was the best and is within a park called Coloured Grounds. A small river flows on the top of a hard band of rock but at this point plunges two hundred feet down into a gorge. The photography point is across from the falls but at the same height as their top. The river divides into three at the cliff edge, and the right most stream itself splits into three smaller portions. The first fifty foot of the cliff is a hard capping stone and the cliff is vertical. Below this is about one hundred feet of softer rock, probably sandstone, and the cliff here is recessed allowing the water to free fall. The final fifty feet of the falls is a 45 degree scree slope of boulders and gravels onto which the streams of water crash. The real beauty was the noise. 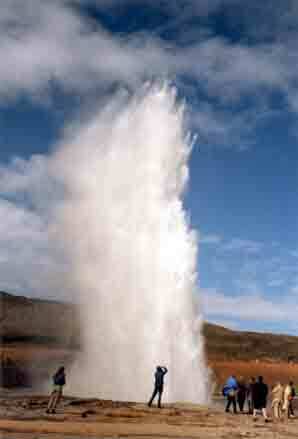 Some waterfalls roar, others boom, some simply gurgle but most have a fairly continuous sound. Here the wind catches the separate torrents and moves them around so that what they hit on the scree slope varies from silent sands to booming boulders. Thus the sound of the waterfall is more like waves breaking along a stretch of beach or the sound of a drummer jamming across the far side of the echoing valley. This photograph is easy to describe. A dozen spectators are standing around a hole on open land and out of the hole is erupting a column of bright white water towering fifty feet or more above their heads. Just before I took the photograph there was simply the spectators around the hole. In a moment the water will have fallen down and dissipated - much of it draining away down the same hole. In a few minutes the scene repeats itself. I can't remember how long I stood there trying to get the shot just right, with the jet at it zenith, but it was in the days before digital photography so every photograph taken had to count. I know the theory of Geysers - water penetrates a crack in the ground until it gets close to a hot magna body at which point the water becomes superheated and turns to steam forcing itself upwards out of the crack. As the water rises through the layers of rock its boiling point lowers hence the intensity of the jet picks up until it shoots out of the ground. What I don't understand is why Geysers are only found in a few locations around the world - Iceland, New Zealand and a couple of areas in the USA. I'm not sure that those areas are geologically or climatically similar so there must be something else to the explanation. 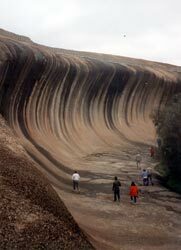 Wave Rock is to be found about one hundred miles inland from Perth in Western Australia. As its name suggests it is a large area of hard granite rock which has been shaped into a wave primarily by wind erosion. It's face is as much as a mile in length and the height of the cliff that forms the wave is about forty foot. The face of the wave is a perfect curve from bottom to top generated by the quartz sand grains being blown round by the wind. The length of the wave also forms a concentric curve throughout it's length. The face of the wave is striped with dark bands probably from minerals in water seeping down the front or mosses growing from such water. There are trees growing in front of the wave suggesting that there has been climatic change since the wave was formed since it is through these trees that the erosive wind would have blown. Imagine a flat sandy terrain and that in that sandy terrain there is a solid sandstone pillar roughly the size of a man. But imagine now that the sandy area occupies a few square miles and that the sandstone pillar is one of thousands of various sizes - some over twenty foot wide, many only a couple of feet high but all lying upright on the sandy floor. That is the Pinnacles just inland from the coast about a hundred miles north of Perth in Western Australia. The photograph is from a high sand dune on the edge of the area and shows the expanse of the Pinnacles and the Indian Ocean in the background. It isn't difficult to work out a theory for how they were formed but where I struggle is to come up for an explanation for why they are here and why the same process of formation hasn't also generated similar features in many other areas.